Back to Overflow index page. If Kristi Mogen causes a crash on the road, she knows she'll probably get a ticket and have to pay a fine. So she's frustrated that Wyoming officials didn't fine Chesapeake Energy Corp. for an April 2012 blowout near her home outside Douglas, Wyo. The ruptured gas well spewed gas and chemicals for three days, forcing her and her neighbors to evacuate their homes. There are thousands of oil spills at the nation's onshore oil and gas well sites every year. But the data are scattered amid databases, websites and even file drawers of state agencies across the country. EnergyWire spent four months mining the data for the most comprehensive report available on the spills that result from the nation's booming oil and gas industry. Click here to view the report. Overall, there were more than 6,000 spills in 2012, an average of more than 16 spills a day. In Texas, officials say they take a "compliance-based" approach. Oil and gas drilling in Texas is overseen by the Texas Railroad Commission, which doesn't regulate trains but is instead an influential regulator among oil and gas agencies. Commission inspectors place a premium on helping drillers get back into compliance with the rules rather than hitting them with fines. Oklahoma has a similar compliance-based approach. An inspector succinctly laid out the thinking last year after following up on a spill of 300,000 gallons of oil and wastewater into pastureland. "Reinspected spill area," the inspector wrote. "Found spill has been cleaned up. Looks OK. Please close incident. No further action anticipated." Environmentalists and other critics say state regulators' reluctance fails to deter repeat violations. No state had more oil and gas spills reported last year than North Dakota -- 1,129. But that figure may demonstrate more about how states track spills than it does about which has the worst record. In North Dakota, companies have to report any spill that's 1 barrel (42 gallons) or larger. In Texas, the threshold is 5 barrels. And in Oklahoma and Montana, it's 10 barrels. "That's really jacking the number up significantly," said Kari Cutting, vice president of the North Dakota Petroleum Council, adding that although companies have chafed at the limits, the group has elected not to try to get the threshold raised. More than half of North Dakota's spills -- 588 -- were 5 barrels or less, while only 6 percent of Texas' 914 spills (53) were 5 barrels or less. 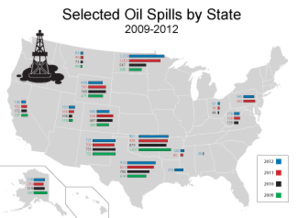 Without the 588 smaller spills, North Dakota would have ranked fourth behind Texas, Oklahoma and New Mexico. Just as the reporting requirements differ in most states, no two states disclose their spill records to the public in the same way. None meshes spill data with details of fines or other enforcement. Besides that, every state is different. New Mexico and Texas post the data online. Montana and Alabama keep their records only on paper in the central office. North Dakota has a detailed spill database that lists details such as the distance from water wells and buildings. But it's not online. Louisiana and Pennsylvania officials said they had no list of spills. Louisiana officials said the information can be found in the database of the Coast Guard's National Response Center. But Pennsylvania Department of Environmental Protection spokesman Kevin Sunday said there were 365 spills last year, a slight increase over the 345 in 2011. In some states, such as California and West Virginia, oil and gas agencies don't track spills, but the state environmental protection agency does. In Wyoming, both the state Department of Environmental Quality and the Oil and Gas Conservation Commission track spills. The situation is similar in Montana, Ohio and other states. States also track very different information. New Mexico and Colorado note whether spills affect water. Colorado had 400 spills, 154 that weren't contained within a berm and 22 of which affected surface water. An additional 63 affected groundwater. Of New Mexico's 734 spills last year, seven affected groundwater. Seven others affected a waterway, such as the pump line that froze in December near Navajo Lake and leaked drilling wastewater over a canyon rim. In Texas, the Legislature's Sunset Advisory Commission found the scant oil and gas enforcement "contributed to a public perception of an unwillingness to pursue enforcement action." But the oil and gas officials at the Railroad Commission defended their approach. "The commission's compliance-based approach serves the public safety of the state's citizens, the state's environment, and the state's economy well," they wrote. A more aggressive, "rules-based system," they said, wouldn't necessarily make drilling safer or more environmentally friendly. Most state oil and gas agencies are charged with promoting drilling in the state, in addition to regulating it. Inspectors and the people who oversee them often come from the oil and gas industry. It's not considered a conflict of interest. It's often a job requirement. "When you deal with the oil and gas agencies, their primary concern is to get the drilling going," said Wilma Subra, a Louisiana-based environmental scientist who monitors state regulation of oil and gas. "Environmental contamination is not a big deal." Industry officials say state regulators aggressively protect the environment and enforce safety. "States have led the way in regulating hydraulic fracturing operations while protecting communities and the environment for decades," Erik Milito, director of upstream and industry operations at the American Petroleum Institute, the industry's largest trade group, said earlier this year. National environmental groups are pushing Congress to give U.S. EPA more authority to regulate the nation's drilling boom instead of leaving regulation to the states. But under President Obama, EPA has frequently retreated from big drilling enforcement cases, such as those in Dimock, Pa.; Parker County, Texas; and Pavillion, Wyo. (EnergyWire, June 13). Mogen said she wants to see her state government take a harder line. "Why not take away their permits [to drill] until Chesapeake gets their act together?" she asked. Some states do hit companies with six-figure fines after major incidents. North Dakota officials demanded a fine of more than $100,000 from Newfield Exploration Co. for a blowout that sprayed oil, gas and produced water for two days near Watford City in December. Newfield is contesting the penalty. A $100,000 fine is large in the world of state oil and gas enforcement. But Newfield is a $2.5 billion company that takes in that much money every 22 minutes. And the deterrent effect of the fine may be limited because it's not widely known. Even David Drovdal, a longtime Republican state legislator who owns the land where the spill occurred, said he wasn't aware of the fine levied for the spill on his property. The North Dakota Department of Mineral Resources also sought a $75,000 fine from Slawson Exploration Co. for a December 2012 blowout near the banks of Lake Sakakawea and $300,000 more for failure to disclose hydraulic fracturing fluid ingredients to the FracFocus website as required. Slawson is contesting the charges. But enforcement is essentially nonexistent in New Mexico, which had some of the biggest spills last year. Inspectors with the state Oil Conservation Division have issued no fines since 2009, when a judge ruled that the agency doesn't have the authority to do so. That means there likely won't be a state fine for a spill of more than 45,000 gallons of oil and brine near Artesia, N.M., in late May that reached the Pecos River. 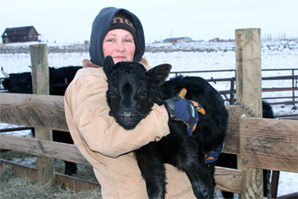 The Chesapeake blowout in April 2012 blew a mist of gas and oil-based drilling mud over ranches and homes in Wyoming, including the one where Mogen, her husband and two daughters raise organic vegetables and grass-fed cattle. A cloud settled over their low-lying property, thick enough that they couldn't see their calf barn 200 feet from their house. When the evacuation ended, they returned to find a petroleum sheen in the water in their stock tank. Kristi Mogen evacuated her Wyoming home after a well blowout in April 2012 left a chemical cloud hanging over her farm. Photo courtesy of Stop the Frack Attack. One of their daughters had nosebleeds for 29 straight days, and a checkup showed she and her husband had dangerously low levels of oxygen in their blood. Mogen says she's perplexed by reports that the state penalizes farmers who break the rules on selling raw milk or green, leafy vegetables for fear of contamination. "But oil and gas companies are allowed to put chemicals in our air and in our soil," said Mogen, who traveled to Washington, D.C., earlier this year for a lobbying day organized by environmental groups. Attempts to get comment from Wyoming Oil and Gas Supervisor Grant Black, who was not in charge at the time of the blowout, were unsuccessful. The investigation report from his agency, the state Oil and Gas Conservation Commission, found human error contributed to the accident but said Chesapeake didn't break any of its rules. "Accidents will happen," Bob King, interim oil and gas supervisor at the time, explained to the Associated Press earlier this year. "I mean, you can't prevent every accident that is going to happen. We don't live in a perfect world." To Mogen, the failure to even cite Chesapeake for a violation added insult to the injury, essentially declaring the blowout and evacuation "a non-incident." "Making people flee their homes, out here in Wyoming where we love our property rights," Mogen said, "that is not a non-incident."